SHOULD OUR SACRED LANGUAGE BE ICELANDIC…… OR ENGLISH? Editors Note: Although originally aimed at an English audience the message conveyed here applies equally to the speakers of any of our Northern languages. Nearly forty years ago a small revolution took place in the Civil Service. The cause was a slim volume entitled ‘Plain Words’ by Sir Ernest Cowers in which the author attacked the then widespread use in official circles of a heavily Latinised form of English. Cowers advocated the restoration of English in its clearest, commonly-called Anglo-Saxon, form and his book was widely distributed not only in the Civil Service but throughout the commercial world. It was said that because of Cowers, policemen giving evidence in court no longer claimed to have perceived a suspect before apprehending him. They simply saw the villain and held him in custody. Before Cowers, business letters and letters from public authorities were frequently smothered by a profusion of Latin tags: in situ. pro tem, de novo and the like. It had long since reached the stage where even a dictionary of the English language was considered incomplete without an added ‘alphabetical list of familiar phrases from the Latin, French and Italian tongues’. Many of these phrases, of course, are with us still and are of great practical use. Few would complain of the occasional ad hoc or post mortem, etcetera and where would we be without the invaluable sic? One would not wish to swing the pendulum in the opposite direction by avoiding all Latin-based words which would, in any case, be an in-possibility. I suppose it all began with the Italian monks. Wishing to maintain their distance from the ordinary people of England and to surround themselves with an aura of magic, mystery and scholarship, they totally excluded our ancestors’ native tongue from their churches and their other proceedings. Latin became a privileged tongue, used to change bread and wine into the flesh and blood of a god – something the Odinist Gothar were quite unable to do. (A later generation was not so easily fooled and the words of consecration were transformed into a new, English, word: ‘hocus-pocus’.) English was treated as the language of the untermensch, of the peasant and the serf. When the Normans took over the running of the country English was again pushed aside and Norman-French became the language of the court as Latin was of the church. Nevertheless English remained the language of the people. The Normans (who were already kin to the indigenous population) were eventually assimilated and English was restored to its rightful place as the language of England. Thanks to Cowers the heyday of the Latin tag is long past although lawyers still delight in mystifying their clients by continuing its use. Those who once scattered them about in their correspondence did so largely from habit and sometimes because they were unable to articulate their thoughts in their own native language. They sought to impress with a spurious learning. Strangely, the desire to foster belief in a mystical language seems to survive in, of all unlikely places, certain sections of the Odinist community. This is not to say that Iceland and Icelandic literature have not been important contributory sources in the preservation and development of our religion. The conversion of the Icelanders has been recorded more carefully than the same event in other countries. A great deal of Odinist ethical teaching derives from examples found in the Edda. Iceland and Icelandic literature will always occupy a special place in Odinist minds and hearts and Icelandic words have indeed been admitted to the ritual Blots and language of the Odinic Rite. But never to confuse or mystify. Moreover, some Odinists have adopted Icelandic versions of pagan names. So it can hardly be charged that we do not hold the Icelandic part of our religious heritage in anything but the highest esteem. Yet there are some who seek alternative, Icelandic, words for plain English or who substitute unfamiliar forms of the names of the gods. Rather than write ‘Thor’, which is the accepted and best-known form of the name wherever English is used and spoken, they use strange (to English eyes and ears) versions. If they can find in some glossary a different spelling of Odin they hasten to use it. Others insert whole phrases, even verses, in Icelandic into the recognised ceremonies of the Odinic Rite. Why do some of us persist in this seemingly futile exercise? Is it perhaps an unconscious hangover from a Christian past? Something that persuades us that a religion must perforce have a secret tongue, a sacred language that is unfamiliar to the people but at the same time more acceptable to the gods? If so, then I have news for any who think that way, for any who would exalt Icelandic to the status of a privileged language: communication presumably being the object of language I feel tolerably certain that the gods themselves understand perfectly well the English language. In England there can be only one sacred tongue and it is not Latin and it is not Icelandic (neither is it Punjabi, which some English children are now being made to learn as a second language). At every one of our Blots we petition the Aesir ‘that we may speak our own North tongue until the end of days’. Icelandic has no more right to be regarded by Odinists as a sacred language than, say, Swedish, Erse, Frisian or German. Icelandic is a kindred language and it would be right to look upon it as the holy language of Icelanders. But it is not ours and it is no more deserving of being elevated to the position of a holy language for all Odinists because it was the original language of the Edda than has German by virtue of the compositions of Richard Wagner. Icelandic may indeed make some people feel different, spiritually apart, and it may help them to feel closer affinity to some of the ancestors who followed our religion in the Elder Days. That is their affair. But to seek to create a language of the altar, a language that is thought to be in some mysterious way more acceptable to the gods, is mistaken. For Englishmen or Englishwomen to suggest that Icelandic is superior to their own native tongue is to ally themselves with those who indulge in the despicable modern creed of national self-hatred. There can be only one sacred language for all English people and that is English. For it is the language of Chaucer, of Shakespeare, Milton, Pope, Dryden, Dickens, Blackmore and Hardy and Kipling. It is the language which is our most valuable birthright, which is spoken and understood by us as successors of those Northern tribes who created England and to whose religious faith we have sworn allegiance. 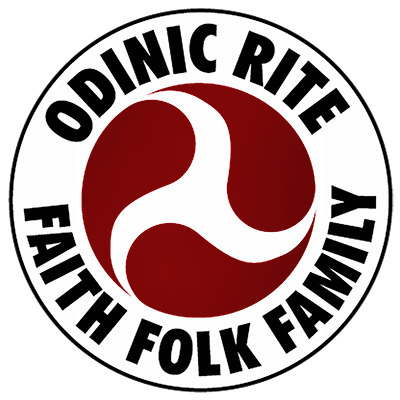 It is the language which we learn from the cradle, the ritual language of the Odinic Rite which is the branch of our true faith in these British Isles, at once a treasured inheritance from the past and a living symbol of present and future unity. English is, and will remain, our sacred language.